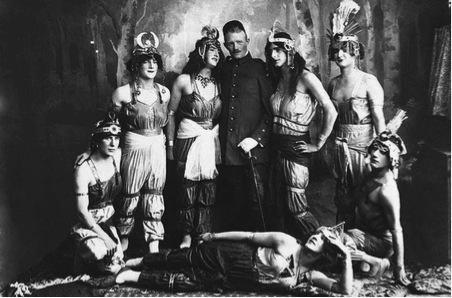 Hans Overbeck (centre) in a theatre production put on by prisoners in Holsworthy camp. Hans Overbeck was an incredible renaissance man; folklorist, entomologist, linguist and businessman. He had the great misfortune to be trapped in the wrong place at the wrong time throughout the first half of the twentieth century. He was an example of how even in incarceration the human spirit to learn and grow can flourish but ultimately he was involved in one of the great tragedies of World War Two. Overbeck’s early years were spent in Bremen, Germany, where he was born 28 March 1882. He moved to Singapore in 1904, aged 22, to join the Singapore office of the prominent Hamburg-based mercantile house Behn, Meyer & Co. and to the Netherlands East Indies in 1908. He travelled widely as Behn, Meyer general agent for the Malay Archipelago (Generalvertreter für Insulinde) until retirement. 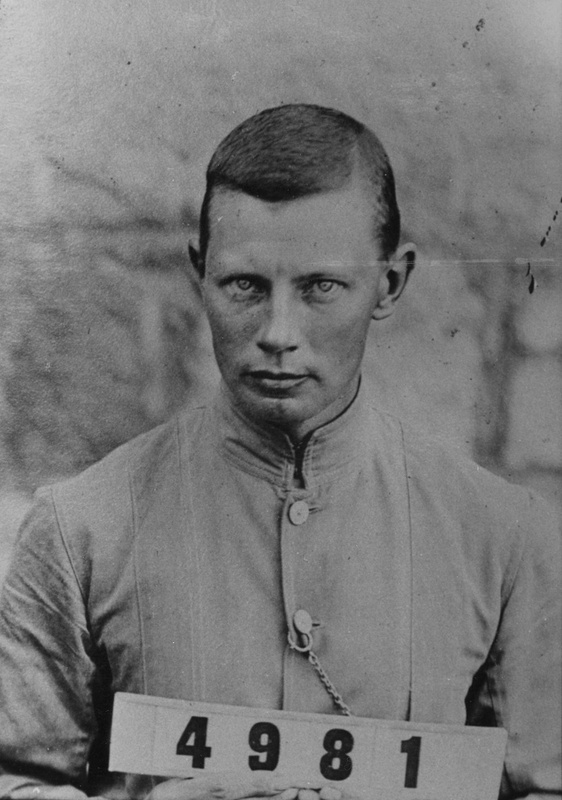 Hans Overbeck was one of many German and Austro-Hungarian men rounded up from British ‘possessions’ in Southeast Asia following the declaration of war with Germany in August 1914 and eventually held as ‘enemy aliens’ at Tanglin Barracks Prison Camp, Singapore. They were later joined by a group of 20 crewmen from the infamous German naval Indian Ocean commerce raider SMS Emden,whose presence was to influence future events. During March/April 1915 271 Tanglin prisoners, including Overbeck, were transported by ship to Australia and interned at Holsworthy Concentration Camp at Liverpool, near Sydney. There they joined what became over 5,000 citizens of German background arrested in Australia and German New Guinea. The National Museum will be borrowing an incredible object from the National Archives, a leather bound photo album containing pictures of every prisoner held within the system. The hurriedly organized move to Sydney followed a deadly mutiny by Indian Army troops of the Singapore Garrison on 15 February 1915 which threatened the safety of the internees, one of whom was killed when the camp was breached. The disturbance enabled a number of prisoners to quit the camp; it resulted in the discovery of an almost completed escape tunnel and suspicion that prisoners had fomented the mutiny by encouraging its leaders. Overbeck was at Holsworthy until August 1915 when, following much social, political and sometimes murderous ethnic conflict in the crowded camp, a number of prisoners—mostly Germans, including the Emden men—were transhipped to isolated Trial Bay on the north coast of New South Wales, to be accommodated in a disused, stone-built former civilian prison, Trial Bay Gaol. Two and a half years later (in May 1918), the Trial Bay prisoners were returned by railway to a new, segregated ‘Eastern’ compound at Holsworthy. After another year, on 29 May 1919, during the WorldWar armistice, they were shipped under heavy guard on the vessel SS Kursk via Durban, the Suez Canal and Plymouth to Rotterdam (22 July), and thence by special train to Germany. Work parties ranged beyond the camps at both Holsworthy and Trial Bay, and such activity would arguably have provided Overbeck ample opportunity for insect collecting in natural bushland. In evidence, a recently discovered photograph shows him with other prisoners working under armed guard as firewood collectors outside the Trial Bay camp perimeter. Overbeck collected other Australian insects. Heller, for example, described a new beetle genus from Liverpool, collected ‘daselbst während seiner Internierung im Konzentrationslager von Herrn H. Overbeck’. While a prisoner in Australia Overbeck compiled his major work, a two volume German translation of the great Malay epic Hikayat Hang Tuah, despite the avowed lack of many desired reference sources. His letters mention that he had documented 1500 Javanese children’s songs and 175 theatrical pieces, and that he had studied Aboriginal language while at Trial Bay, implying perhaps that the prisoners had (otherwise unreported) access to local indigenous Australians. 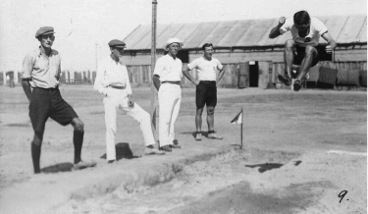 A long jump competition at Holsworthy camp. Following the Great War Overbeck lived in Java, first in Semarang, where he acted for two years as German Consul, and later (from1925) in Surabaya. He retired as Behn, Meyer Director-General for South-East Asia, and soon moved to Yogyakarta. Overbeck was again incarcerated as an enemy alien by the Netherlands East Indies authorities following the German invasion of the Netherlands in May 1940. He was held at prison camps near Ngawi, Java and at Allas Vallei, Sumatra, where family correspondence transmitted by the German Red Cross shows him to have been deeply pessimistic and depressed. He was transferred with 364 other Allas Vallei prisoners on 15 January 1942 to the steamer Van Imhoff for shipment from Sibolga, Sumatra, to Bombay. The ship was bombed by a Japanese aircraft south of Nias on 18 January, and sank slowly following the departure of the 120-member Dutch crew and military guards in five lifeboats allegedly with unoccupied space. Hans Overbeck tragically died in the sinking.